Duchess Kate: The Down To Earth Duchess shops in Tesco and enjoys a romantic stroll with William! The Down To Earth Duchess shops in Tesco and enjoys a romantic stroll with William! After an exciting weekend in Scotland celebrating the wedding of Zara Philips and Mike Tindall, William and Kate were eager to get back to normal. The couple decided to enjoy a leisurely, romantic stroll in a park close to the grounds of Holyroodhouse where the wedding reception was held. Walking hand in hand the carefree couple looked happy and in love. (Which we all love to see :)) Duchess Kate looked beautiful as always with her hair swept back into a high ponytail. She wore dark skinny jeans, a purple sweater and jeans. 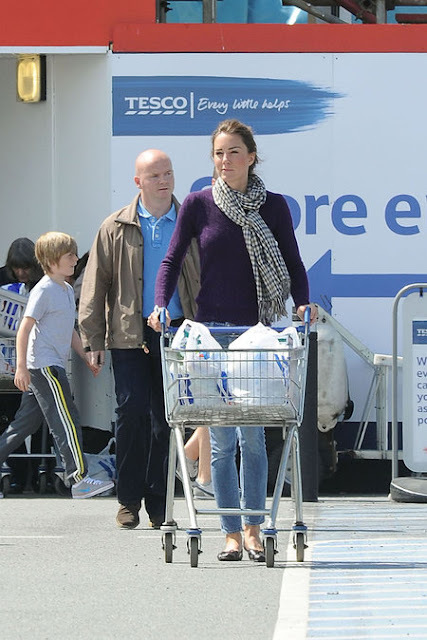 William and Kate then returned to their permanent residence in Anglesey, Wales where Kate was photographed shopping in her local Tesco in Holyhead. Can you imagine shopping in your local Tesco and running into royalty? Not something one would expect! 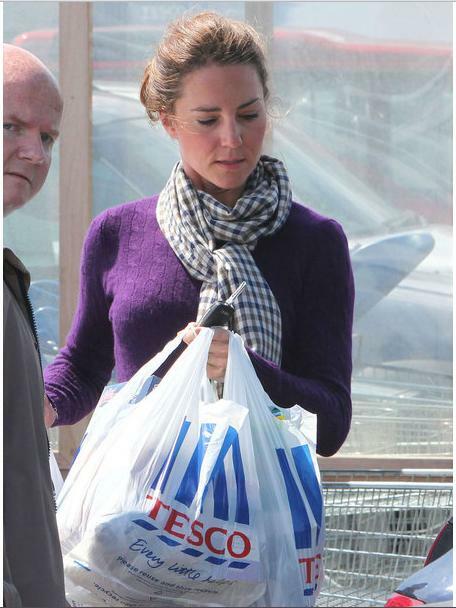 Kate spent around half an hour picking up essentials such as Kellogg's cereal and plastic bags. Again Kate wore the same purple sweater, this time teamed with a black and white checkered scarf by Aquascutum, blue skinny jeans and black flat shoes. I think Kate pulls off casual chic excellently, She looks effortlessly stylish in these photos. Despite being the Duchess of Cambridge it is clear she is eager to maintain a normal life. With William returning to work as a RAF pilot, Kate is enjoying the role of housewife until royal duties call again! Wish I looked that good when I went shopping! Great pictures! Kate reminds me of Nicole Kidman sometimes, in the sense that she looks just as good in jeans as a designer gown. I actually prefer this kind of look on her. she looks really upset to be photographed here...so does her policeman!